Kit for blowing - Cifarelli S.p.A. The kit for blowing is an accessory applicable to Cifarelli sprayers of the series 3 and allows, after the removal of some parts of the atomizer and the assembly of the pipes for blowing, to use the machine to blow air. 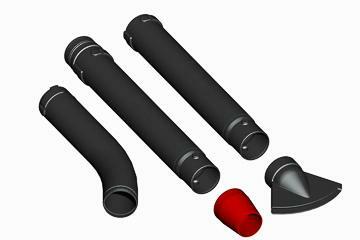 The kit is composed of extension pipes and air exit. The terminals of the kit allow you to direct the air blowing in an optimal way.